So after making this outstanding roast chicken I had put the carcass and gizzards in the freezer to make stock another time. It worked so well-I just let them defrost on a baking sheet for about an hour. This stock is delicious. It’s got that deep chicken flavor that amazing chicken soups have-so many layers of tasty. Roasting the carcass and gizzards makes a huge difference in the end product. It really brings out the great flavors in what’s left on the bones. Don’t skip that step. This photo really shows the deep color well. 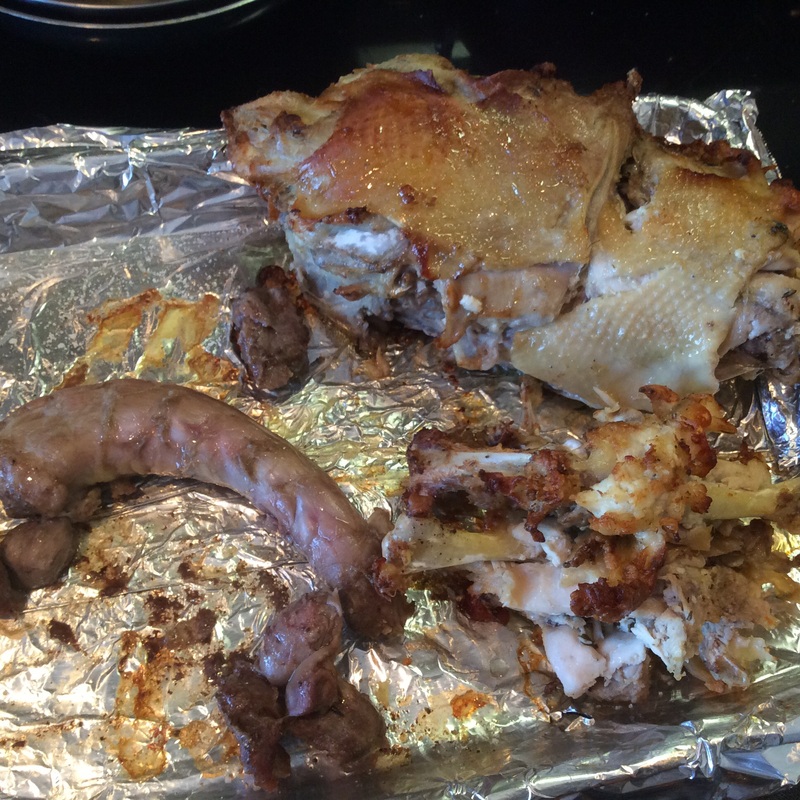 Place carcass and chicken pieces on a roasting pan lined with foil. Drizzle with olive oil and sprinkle with salt and pepper. While chicken is roasting sautee the onion, celery and carrot slowly to brown them in a large dutch oven. When they’re brown but still very firm add the broth and scrape up the brown bits with a wooden spoon. Add the garlic and all of the chicken pieces to the vegetables. Pour water over all until it covers the chicken completely plus a bit more. Add the bay leaf and cider vinegar. Bring to a boil then reduce to a simmer. Cook for 3 hours, skimming any foam that appears and adding water as needed to cover the chicken. Discard the carcass and pour through a strainer into a large bowl to remove any pieces. Press the vegetables to remove all of the liquid. Discard carcass and left over vegetable pieces. Allow to cool then place the bowl in the fridge overnight. In the morning skim off the fat that has collected on the top. It’s very easy to use a fine screen spider for this. Pour, through the same spider, into jars or bags for freezing. 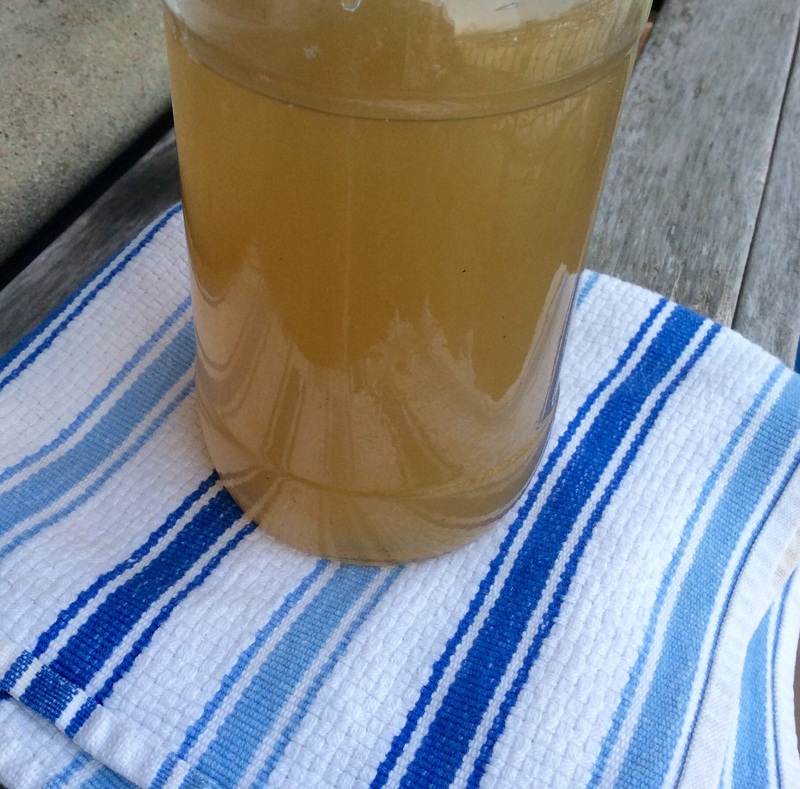 This recipe makes 1 28oz jar and 1 quart sized zip lock bag. This is the roasted carcass and bits. Those extra roasted pieces make a big difference in flavor! Roasting veggies is my favorite way to cook them. Is it your favorite way as well? They stay so crispy and the flavors are so nice! A simple olive oil, salt and pepper is all that’s needed to make them yummy. And it made for a beautifully colorful dish. Hmmmm orange, white and green. I’ll remember that for St. Patrick’s Day. I served these on Christmas Eve along with this Pot Roast and mashed potatoes and they were perfect. 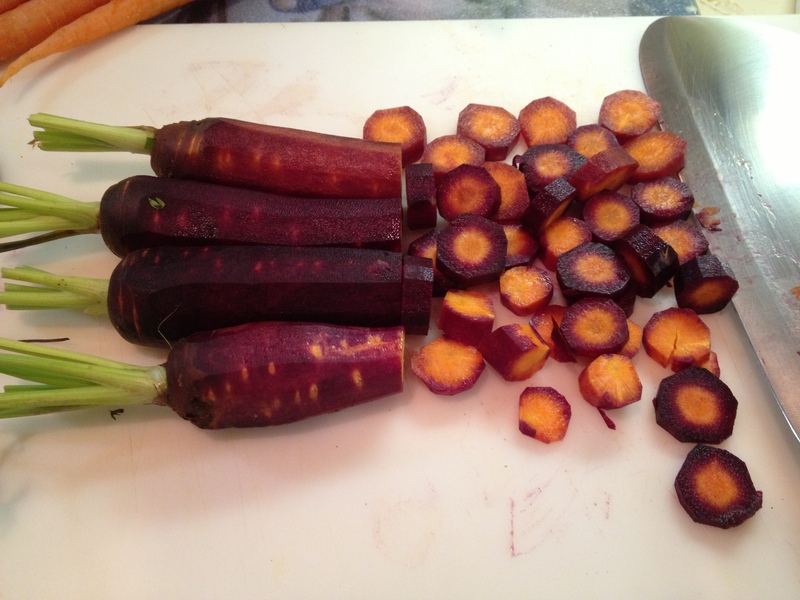 I had intended on making only carrots but there were no purple ones to be found at the store that day so i picked up some parsnips instead. I already had the green beans at home. 3 bunches baby carrots (the real baby carrots-not the little ones in the bag), about 1 lb, peeled and cut into inch lengths. Spread out all of the carrots and parsnips onto the baking sheet, drizzle with olive oil and sprinkle with salt, pepper and garlic powder. Cook in the oven for about 15 minutes. Remove the baking sheet from the oven, add the green beans, spread them around and add more olive oil, salt, pepper and garlic powder if needed. Remove from the oven and serve right away. I like doing my grocery shopping on Friday evening, on the way home from work. My local Fairway Market is only about a mile away and is empty at that time so I have time to browse and pick up some fun stuff. Last time I was there I noticed they had some really pretty maroon carrots. Next to those were golden beets. Aren’t they gorgeous? 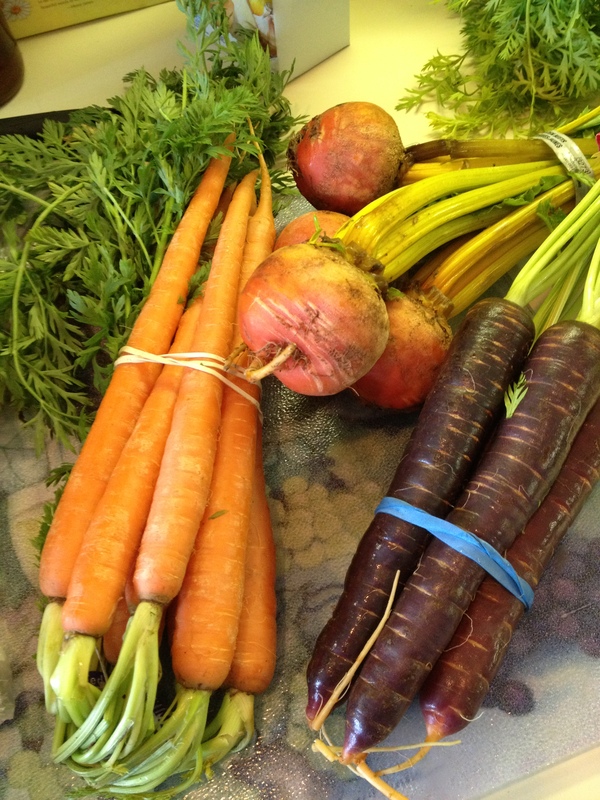 I’d never had maroon carrots or golden beets either at home or out. I was curious how they tasted and really-they’re gorgeous!! They are delicious and pretty and just a nice change all around. I started wondering what a carrot soup made with the maroons would look like-or carrot cake. Might be fun. I couldn’t name this post just ‘roasted veggies’. They’re too colorful for that. So I brought them home and peeled them and cut them up and put them on a cookie sheet with foil to roast. 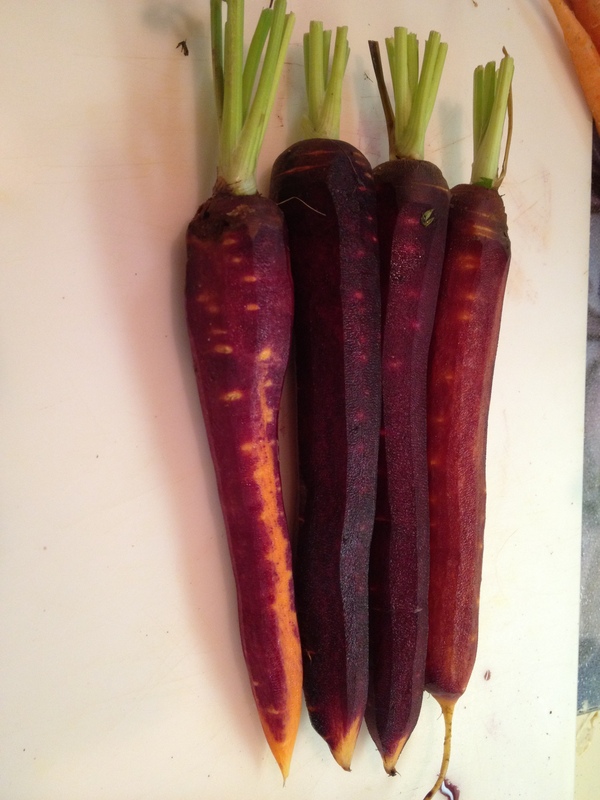 Watch out-the maroon carrots’ juice stains. Wear an apron. What came out of the oven was a veritable stained glass window of veggies. So pretty and DELICIOUS!! Lay the veggies on the foil, drizzle with olive, sprinkle with salt and pepper to taste and roast for about 15 minutes. I had to include this photo because it’s just really pretty. Look at that carrot streaked with orange-just gorgeous. Carrots, Parsnips and White Sweet Potato all roasty. Yum. I don’t cook with Parsnip often, or White Sweet Potato for that matter, but the combination of them with Carrots was perfect for a fall side dish. Super easy and the only time involved is the peeling and chopping of the veggies. Next time I make these I will add some peppers or green veggies. It needed some color and some texture difference but all around they were pretty tasty. The original recipe called for a regular sweet potato but, since I’d never had a white one and my grocery store had some I figured I’d use that instead. Preheat the oven to 400. Chop veggies into similar sized pieces-I cut mine into 1/4 inch rounds. 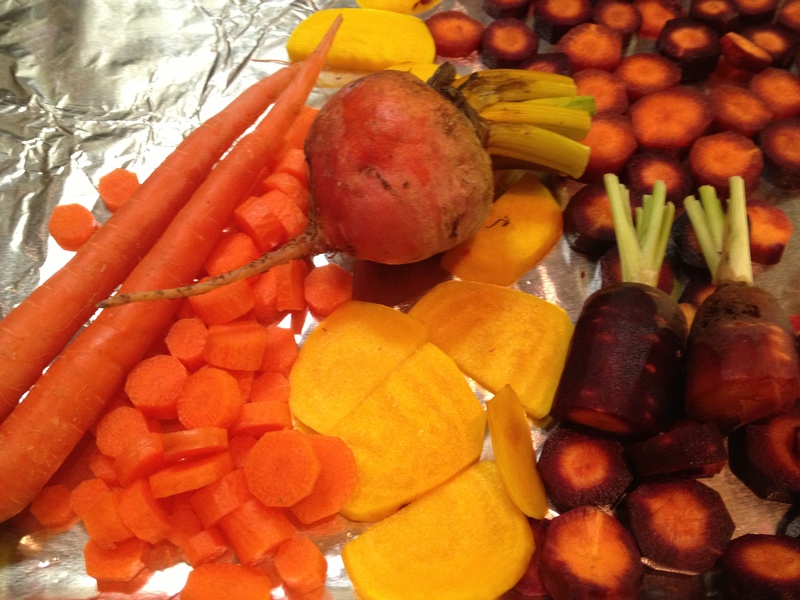 Arrange the veggies on a foil lined cookie sheet. Drizzle with olive oil, season with salt and pepper and stir to combine. Roast for about 20 minutes or to desired done-ness, stirring occasionally. Sprinkle with parsley and additional salt and pepper if needed and serve warm. Slightly adapted from this recipe from Simple Gourmet Cooking, who cites it from Ina Garten’s Barefoot Contessa: Back to Basics. Thanks to Sarah from http://tasteofhomecooking.blogspot.com for organizing the swap!! What a delicious combination of onion, red pepper and tomato. I made this on Sunday morning and put it in the fridge to cool and then was invited to a friends house for some wine and apps. I brought some with me and it was great chilled and put onto toasted pita wedges. This can be served warm, cold or at room temperature and is so versatile! Put it on a sandwich or on a cracker or eat as a side salad…the list goes on an on. Such a fresh refreshing little salad. Cut the bell peppers into 2 inch squares. In a saucepan over low heat, combine the peppers, olive oil, onion and bay leaves and cook, stirring often, until the vegetables are softened and have released their juices-about 15 minutes. 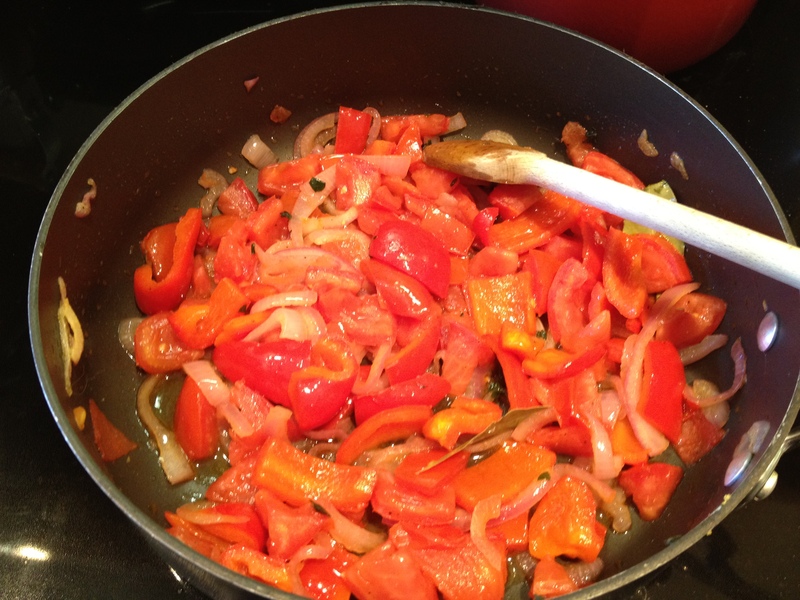 Add the tomatoes, season to taste with salt and pepper and simmer gently until the vegetables are soft, about 5 minutes. Remove and discard the bay leaves. Slightly adapted from Williams-Sonoma Florence cookbook. Is there really anything better than crispy pancetta? In my opinion-no. 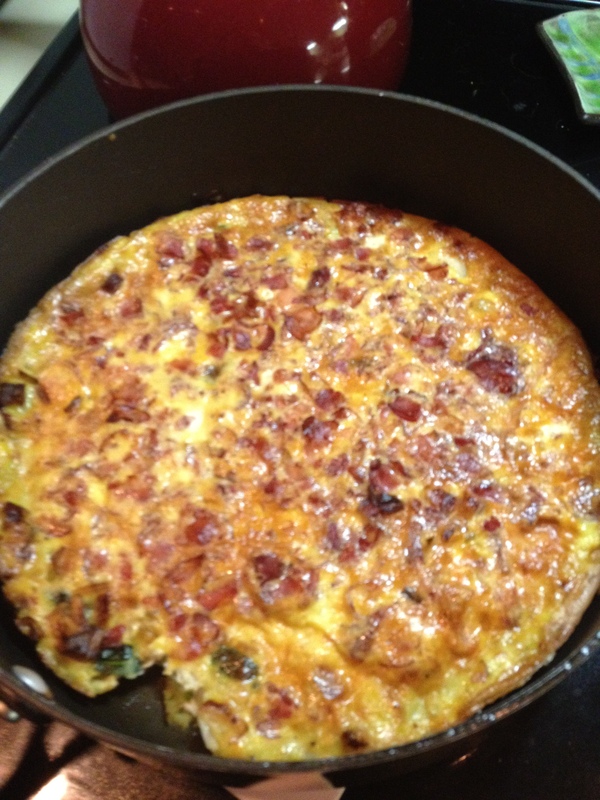 This fritatta is delicious!!! 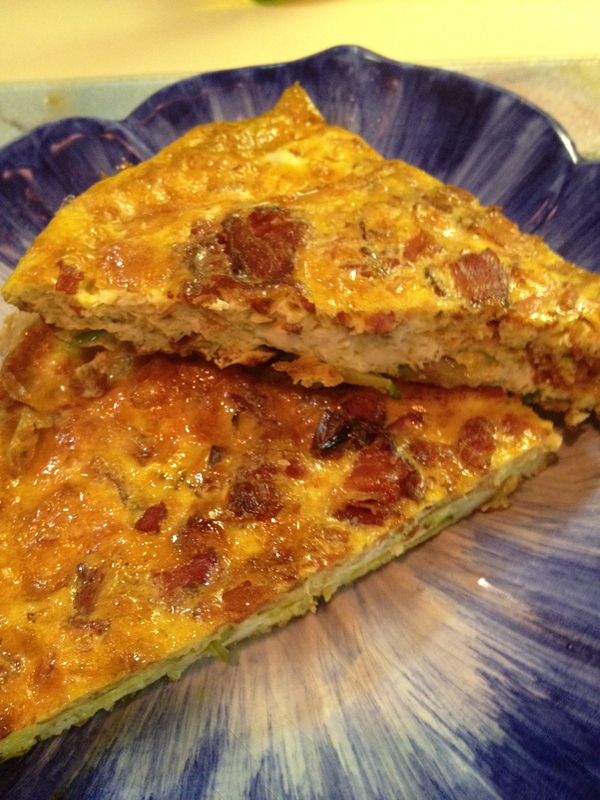 I love the taste of the leeks, the crispy texture of the pancetta and the chunks of zucchini. Preheat the broiler or the oven to 400f. In a bowl lightly beat the eggs until blended and season with pepper. Cut the leeks into rings crosswise, put them in a colander and rinse-separating rings-to remove any soil. They’re really dirty little buggers-clean them well. Drain well and pat dry. In a large frying pan over medium heat cook the pancetta to desired crispyness then remove with a slotted spoon and set aside on a paper towel to drain the excess oil. Pour the eggs over the top and reduce the heat to low. Sprinkle the pancetta evenly over the top. Cook, occasionally running a spatula around the outside to keep it from sticking, until the sides and bottom are set but the center is still loose. Place pan under the broiler and cook until the top is firm and golden-about 5 minutes. This can be served warm or cold. Depending on how large you slice it and which size pan you use you will have 4-8 servings. For me though-this made only 2 servigs as I was a pig and ate half.